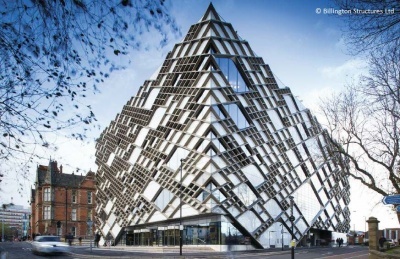 ‘The Diamond’ is a new Undergraduate Engineering Facility for The University of Sheffield providing specialist engineering laboratories, lecture theatres, flexible seminar rooms, open-plan learning and social spaces, a library and café. The building’s design is both conceptual and practical, as well as being sympathetic to the existing architecture of the area. Its name derives from its unique exterior façade of interconnected diamonds in anodised aluminium that are fitted to the exterior glass cladding. 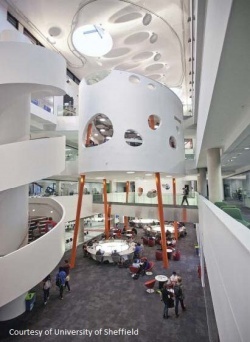 With a BREEAM ‘Excellent’ rating the structure is environmentally efficient. The positioning of windows maximises the inflow of natural light into the laboratories, and aids ventilation without the sole reliance on air conditioning. The windows are designed to control solar gain within the building, with larger openings to the north façade and smaller panels on the south side, as well as the inclusion of well-positioned opaque panels. The connections to the façade panels were formed using offsite shop-welded propriety studs which reduced costs significantly and saved weeks of additional construction time. The city centre site produced several challenges and restricted access, so timings for deliveries were paramount. The steel was lotted in approximately 5-10 tonne lots to arrive and be erected in numbered sequence for safety, practicality due to limited onsite storage and stability during construction. The programme also had to consider minimising the disruption to the students. The façades had to be accessed partly from ground and partly from the structure which resulted in numerous challenges. As such, specific MEWPs had to be selected which had a big reach but were sufficiently lightweight so as not to cause load capacity issues on certain platforms. Steelwork Contractor Billington Structures Ltd.